© 2016 The original authors. Provides Apache Camel integration with the WildFly Application Server. The WildFly-Camel subsystem allows you to add Camel Routes as part of the WildFly configuration. Routes can be deployed as part of JavaEE applications. JavaEE components can access the Camel Core API and various Camel Component APIs. This chapter takes you through the first steps of getting WildFly-Camel and provides the initial pointers to get up and running. Simply unpack the provided patch into the a supported WildFly installation. For possible WildFly target versions, see the compatibility page. The patch does not modify existing configuration files. Instead it comes with a number of additional configurations files that end in -camel.xml. To add the Camel subsystem to existing configurations you can run the following command. The domain mode is not supported for the Camel subsystem. The easiest and most portable way to run WildFly-Camel is to use the wildflyext/wildfly-camel distribution. To get started with writing Camel JEE applications, there are two Maven archetypes that can generate either a Camel Spring XML or Camel CDI application. To generate a Camel CDI application, run the following from the command line. To generate a Camel Spring XML application, run the following from the command line. Instructions on how to build, test and run the project can be found within the generated README files. This chapter provides the necessary information about WildFly-Camel features. The WildFly-Camel test suite uses the WildFly Arquillian managed container. This can connect to an already running WildFly instance or alternatively start up a standalone server instance when needed. A number of test enrichers have been implemented that allow you to have these WildFly-Camel specific types injected into your Arquillian test cases. The WildFly-Camel Subsystem only supports the camel-servlet and camel-undertow components for use with the REST DSL. However, it does not work if you configure the other components. An example Camel CXF application is available on GitHub. WebService support is provided through the CXF component which integrates with the WildFly WebServices subsystem that also uses Apache CXF. When the WildFly web service subsystem detects classes containing JAX-WS annotations, it bootstraps a CXF endpoint. In this example the service endpoint will be located at http://hostname:port/context-root/greeting. Example JAX-WS applications are available on GitHub. Messaging support is provided through the JMS component which integrates with the WildFly Messaging (ActiveMQ Artemis) subsystem. You can configure the WildFly messaging subsystem through the standard WildFly XML configuration files. For example, standalone.xml file. Also, you can create a messaging-deployment configuration within a custom jms.xml deployment descriptor. See section 'Deployment of -jms.xml files' within the WildFly messaging subsystem documentation for more information. The following JMS producer and consumer examples make use of WildFly’s embedded ActiveMQ Artemis server to publish and consume messages to and from destinations. The DefaultJMSConnectionFactory connection factory is injected into the RouteBuilder from JNDI. Under the WildFly XML configuration, you can find the connection factory, within the messaging subsystem. 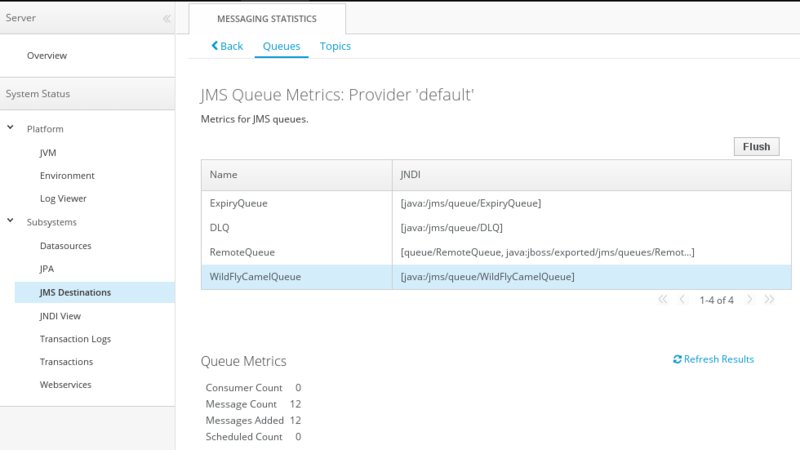 A log message will be output to the console each time a JMS message is added to the WildFlyCamelQueue destination. To verify that the messages really are being placed onto the queue, you can use the WildFly administration console. To enable Camel JMS routes to participate in JMS transactions, some additional configuration is required. 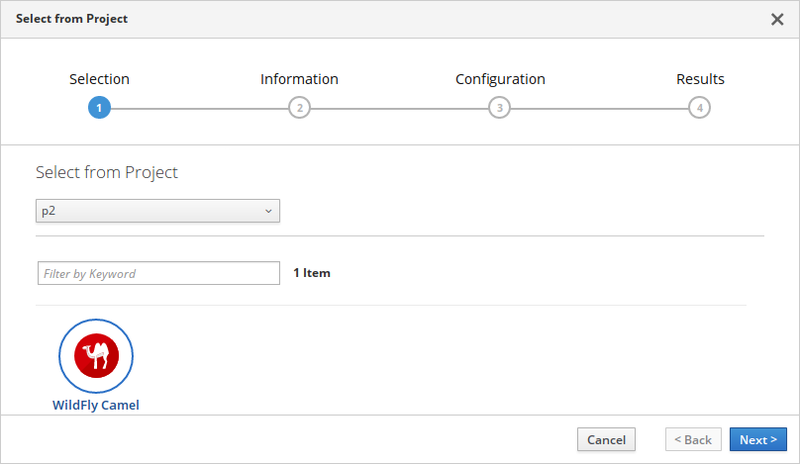 Since camel-jms is built around spring-jms, you need to configure some Spring classes to enable them to work with WildFly’s transaction manager and connection factory. The following code example demonstrates how to use CDI to configure a transactional JMS Camel route. The camel-jms component requires a transaction manager of type org.springframework.transaction.PlatformTransactionManager. Therefore, you start by creating a bean extending JtaTransactionManager. Note that the bean is annotated with @Named to allow the bean to be registered within the Camel bean registry. Also note that the WildFly transaction manager and user transaction instances are injected using CDI. 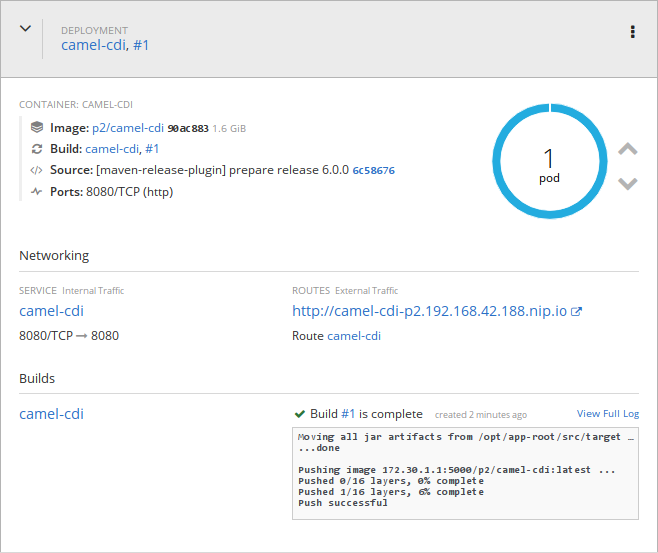 Now you can configure our Camel RouteBuilder class and inject the dependencies needed for the Camel JMS component. The WildFly XA connection factory is injected together with the transaction manager that has been configured earlier. It is possible for one WildFly instance to send messages to ActiveMQ Artemis destinations configured on another WildFly instance through remote JNDI. Some additional WildFly configuration is required to achieve this. First an exported JMS queue is configured. You must configure the queue on the WildFly client application server andWildFly remote server. The configureInitialContext method creates this InitialContext. Notice that you need to set a provider URL which should reference your remote WildFly instance host name and port number. This example uses the WildFly JMS http-connector, but there are alternatives documented here. An example camel-jms application is available on GitHub. You can provide management support through the JMX component which integrates with the WildFly JMX subsystem. In the following example, you can use the WildFly in-memory ExampleDS datasource which is configured within the WildFly standalone.xml configuration file. This chapter provides information about supported camel components. Configure the WildFly resource adapters subsystem for the ActiveMQ adapter. 4) Start WildFly. If everything is configured correctly, you should see a message within the WildFly server.log like. A log message will be output to the console each time a message is added to the WildFlyCamelQueue destination. To verify that the messages really are being placed onto the queue, you can use the ../features/hawtio.md[Hawtio console,window=_blank] provided by the WildFly-Camel subsystem. The XML snippet below shows how the resource adapter is configured within the WildFly server XML configuration. Notice that the ServerURL is set to use an embedded broker. The connection factory is bound to the JNDI name java:/ActiveMQConnectionFactory. This will be looked up in the RouteBuilder example that follows. The camel-activemq component requires a transaction manager of type org.springframework.transaction.PlatformTransactionManager. Therefore, you can start by creating a bean extending JtaTransactionManager which fulfills this requirement. Note that the bean is annotated with @Named to allow the bean to be registered within the Camel bean registry. Also note that the WildFly transaction manager and user transaction instances are injected using CDI. The ahc-ws component provides Websocket based endpoints for a client communicating with external servers over Websocket. The component uses the ahc component that in turn uses the Async Http Client library. The amqp component supports the AMQP 1.0 protocol using the JMS client of the Qpid project. The asterisk component allows you to interface with an Asterisk PBX Server using asterisk-java. The atmosphere-websocket component provides Websocket based endpoints for a servlet communicating with external clients over Websocket (as a servlet accepting websocket connections from external clients). The component leverages the Atmosphere websocket library. Atom feed consumption in Camel is provided by the atom component. The following example configures an Atom endpoint to consume the recent activity GitHub feed of user 'wildflyext'. The raw content of each feed entry is then written out as a file within directory 'feed/entries'. The atomix-map component allows you to work with Atomix’s Distributed Map collection. The atomix-messaging component allows you to work with Atomix’s Group Messaging. The atomix-multimap component allows you to work with Atomix’s Distributed MultiMap collection. The atomix-queue component allows you to work with Atomix’s Distributed Queues. The atomix-set component allows you to work with Atomix’s Distributed Set collection. The atomix-value component allows you to work with Atomix’s Distributed Value. The avro component provides a dataformat for avro, which allows serialization and deserialization of messages using Apache Avro’s binary dataformat. Moreover, it provides support for Apache Avro’s rpc, by providing producers and consumers endpoint for using avro over netty or http. The AWS CloudWatch component allows messages to be sent to an Amazon CloudWatch metrics. The AWS DynamoDB component supports supports storing and retrieving data from/to Amazon’s DynamoDB service. The AWS DynamoDB Stream component supports receiving messages from Amazon DynamoDB Stream service. The AWS EC2 component supports create, run, start, stop and terminate AWS EC2 instances. The AWS CloudWatch component supports receiving messages from and sending messages to Amazon Kinesis service. The AWS S3 component supports storing and retrieving objects from/to Amazon’s S3 service. The AWS SDB component storing and retrieving data from/to Amazon’s SDB service. The AWS Simple Email Service component supports sending emails with from Amazon’s SES service. The AWS SNS component allows messages to be sent to an Amazon Simple Notification Topic. The AWS SQS component sending and receiving messages to Amazon’s SQS service. The AWS Simple Workflow component supports managing workflows from Amazon’s Simple Workflow service. The azure-blob component supports storing and retrieving the blobs to/from Azure Storage Blob service. The azure-queue component supports storing and retrieving the messages to/from Azure Storage Queue service. The beanstalk component provides a Camel component for job retrieval and post-processing of Beanstalk jobs. The bean-validator component provides support for message body validation using the Java Bean Validation API. The goal of bindy is to allow the parsing/binding of non-structured data to/from Java Beans that have binding mappings defined with annotations. We can use the BindyCsvDataFormat data format unmarshall CSV data like John,Doe to the domain model. The Box component provides access to all of the box.com APIs. The braintree component provides access to Braintree Payments trough through their Java SDK. The caffeine-cache component enables you to perform caching operations using The simple cache from Caffeine. The caffeine-loadcache component enables you to perform caching operations using The Load cache from Caffeine. The cassandra component is an open source NoSQL database designed to handle large amounts on commodity hardware. Like Amazon’s DynamoDB, Cassandra has a peer-to-peer and master-less architecture to avoid single point of failure and guarantees high availability. Like Google’s BigTable, Cassandra data is structured using column families which can be accessed through the Thrift RPC API or a SQL-like API called CQL. Camel CDI EAR deployments on WildFly-Camel have some differences in class and resource loading behaviour, compared to standard WAR or JAR deployments. WildFly bootstraps Weld using the EAR deployment ClassLoader. WildFly also mandates that only a single CDI extension is created and shared by all EAR sub-deployments. This results in the 'Auto-configured' CDI Camel Context using the EAR deployment ClassLoader to dynamically load classes and resources. By default, this ClassLoader does not have access to resources within EAR sub-deployments. For EAR deployments, it is recommended that usage of the 'Auto-configured' CDI Camel Context is avoided and that RouteBuilder classes are annotated with @ContextName, or that a CamelContext is created via the @ImportResource annotation or through CDI producer methods and fields. This helps WildFly-Camel to determine the correct ClassLoader to use with Camel. The chunk component allows for processing a message using a Chunk template. The cm-sms component enables you to integrate with the CM SMS API. The cmis component uses the Apache Chemistry client API and allows you to add / read nodes to / from a CMIS compliant content repositories. The coap component enables you work with the CoAP protocol. The protocol is designed for machine-to-machine (M2M) applications and is suitable for IoT devices. The consul component allows you to work with Consul a distributed highly available datacenter-aware service discovery and configuration system. The couchbase component allows you to treat CouchBase instances as a producer or consumer of messages. The couchdb component enables you to treat CouchDB instances as a producer or consumer of messages. Secure message exchanges in camel is provided by the crypto component. With Camel cryptographic endpoints and Java’s Cryptographic extension it is easy to create Digital Signatures for Exchanges. Camel provides a pair of flexible endpoints which get used in concert to create a signature for an exchange in one part of the exchange’s workflow and then verify the signature in a later part of the workflow. Begin by loading a keystore for binding to JNDI so that camel can discover it from its bean registry. Finally, a Camel route that signs and verifies an exchange. You can create CMS Enveloped Data instances, decrypt CMS Enveloped Data instances, create CMS Signed Data instances, and validate CMS Signed Data instances. Covered by JAX-RS and JAX-WS. The configuration of camel-cxf consumers on WildFly is different to that of standalone Camel. Producer endpoints work as per normal. In this instance, Undertow is configured to listen on interfaces / ports specified by the http and https socket-binding. By default this is port 8080 for http and 8443 for https. However, the consumer is still available on the default host & port localhost:8080 or localhost:8443. Applications which use camel-cxf consumers must be packaged as a WAR. In previous WildFly-Camel releases, other types of archive such as JAR were permitted, but this is no longer supported. WildFly-Camel supports securing camel-cxf consumer endpoints with the Elytron security framework. The <http-authentication-factory> named application-http-authentication, holds a reference to a Elytron security domain called ApplicationDomain. For more information on how to configure the Elytron subsystem, refer to the Elytron documentation. Note that the <url-pattern> defined by the Servlet Specification is relative to the context path of the web application. If your application is packaged as my-app.war, WildFly will make it accessible under the context path /my-app and the <url-patternpattern> /webservices/* will be applied to paths relative to /my-app. For example, requests against http://my-server/my-app/webservices/my-endpoint will match the /webservices/* pattern, while http://my-server/webservices/my-endpoint will not match. This is important because WildFly-Camel allows the creation of camel-cxf endpoint consumers whose base path is outside of the host web application context path. For example, it is possible to create a camel-cxf consumer for http://my-server/webservices/my-endpoint inside my-app.war. The digitalocean component allows you to manage Droplets and resources within the DigitalOcean cloud with Camel. The Disruptor component provides asynchronous SEDA behavior much as the standard SEDA Component, but utilizes a Disruptor instead of a BlockingQueue. The Disruptor VM component provides a Disruptor based alternative to VM endpoints. The docker component enables you to integrate with Docker APIs via the docker-java client. The dozer component provides the ability to map between Java beans using the Dozer mapping framework. Camel also supports the ability to trigger Dozer mappings as a type converter. The Dropbox component enables you to integrate with the Dropbox API in order to download, upload and manipulate files. The elasticsearch-rest component allows you to interface with an ElasticSearch 6.x API using the REST Client library. The ElSql component enables you to write SQL queries through ElSql. The camel-etcd component enables you to interact with etcd key/value store clusters. The exec component enables you to execute system commands. The Facebook component provides access to all of the Facebook APIs. You will require a valid developer account in order to use it. The file component provides access to file systems, allowing files to be processed by any other Camel Components or messages from other components to be saved to disk. Here is a simple route that prepends the message with 'Hello' and writes the result to a file in WildFly’s data directory. The freemarker component enables you to use FreeMarker templates in your camel routes. The ftp component provides access to remote file systems over the FTP and SFTP protocols. The Ganglia component provides a mechanism to send a value (the message body) as a metric to the Ganglia monitoring system. The Geoder component is used for looking up geocodes (latitude and longitude) for a given address, or reverse lookup. The component uses the Google Geocoder API library. The git component enables you to interact with Git repositories. The github component enables you to interact with the GitHub API. The Google Bigquery component provides access to Cloud BigQuery Infrastructure via the Google Client Services API. The google-calendar component provides access to Google Calendar via the Google Calendar API v3. The google-drive component provides access to Google Drive via the Google Drive API v2. The google-mail component provides access to Gmail via the Google Mail Web APIs. The google-pubsub component provides access to Cloud Pub/Sub Infrastructure via the Google Client Services API. The grpc component enables you to call or expose Remote Procedure Call (RPC) services using Protocol Buffers (protobuf) exchange format over HTTP/2 transport. The http://camel.apache.org/guava-eventbus.htmlguava-eventbus,window=_blank] component provides integration bridge between Camel and Google Guava EventBus infrastructure. The hazelcast component allows you to work with the Hazelcast distributed data grid/cache. Hazelcast is a in memory data grid, entirely written in Java (single jar). It offers a great palette of different data stores like map, multi map (same key, n values), queue, list and atomic number. The main reason to use Hazelcast is its simple cluster support. The hdfs2 component enables you to read and write messages to and from an HDFS file system using Hadoop 2.x. HDFS is the distributed file system at the heart of Hadoop. The headersmap component provides a faster implementation of a case-insensitive map which can be plugged in and used by Camel at runtime to have slight faster performance in the Camel Message headers. The http4 component provides HTTP based endpoints for calling external HTTP resources. The hystrix EIP provides integration with Netflix Hystrix to be used as circuit breaker in Camel routes. The IEC 60870-5-104 Client component provides access to IEC 60870 servers using the Eclipse NeoSCADA™ implementation. The IEC 60870-5-104 Server component provides access to IEC 60870 servers using the Eclipse NeoSCADA™ implementation. This infinispan component allows you to interact with Infinispan distributed data grid / caches. You can interact with container managed Infinispan caches by referring to their JNDI lookup within your Camel route. For example, to write a cache entry. Or you can interact with external Infinispan caches. The irc component enables you to publish and consume messages from IRC channels. The jasypt component provides a simplified encryption library which makes encryption and decryption easy. Camel integrates with Jasypt to allow sensitive information in Properties files to be encrypted. The jcache component enables you to perform caching operations using JCache (JSR-107) as the Cache Implementation. The camel-jclouds component allows interaction with cloud provider key-value engines (blobstores) and compute services. The component uses jclouds which is a library that provides abstractions for blobstores and compute services. The jsch component allows you to add/read nodes to/from a JCR compliant content repository (e.g. Apache Jackrabbit) with its producer, or register an EventListener with the consumer. The jdbc component provides access to SQL databases via JDBC. The jgroups component provides reliable multicast communication via the JGroups toolkit. The jolt component allows you to process JSON messages using the JOLT specification. The jsch component enables secure file transfer using the SCP protocol. The json-validator component performs bean validation of the message body agains JSON Schemas using the Everit JSON Schema library. The jsch component allows you to exchanges messages with an AS/400 system using data queues. The kafka component is used for communicating with Apache Kafka message broker. The ldap component provides the capability to integrate with Kubernetes and OpenShift clusters to create, read, update & delete resources. The ldap component provides the capability to perform LDAP queries. The ldif component allows you to do updates on an LDAP server from a LDIF body content. The leveldb component provides access to the Google LevelDB lightweight and embeddable key value database. It allows together with Camel to provide persistent support for various Camel features such as Aggregator. The linkedin component provides access to the LinkedIn REST APIs. You must have a valid developer account in order to use this component. The LRA component provides bindings of the Saga EIP with any Microprofile compatible LRA Coordinator. The lucene component is based on the Apache Lucene project. Apache Lucene is a powerful high-performance, full-featured text search engine library written entirely in Java. The lumberjack component retrieves logs sent over the network using the Lumberjack protocol, from Filebeat for instance. By default, Camel will create its own mail session and use this to interact with your mail server. Since WildFly already provides a mail subsystem with all of the relevant support for secure connections, username and password encryption etc, therefore, it is recommended to configure your mail sessions within the WildFly configuration and use JNDI to wire them into your Camel endpoints. First you configure the WildFly mail subsystem for the Mail server. The following example adds configuration for Google Mail IMAP and SMTP . This example uses the SMTPS protocol, together with CDI in conjunction with the camel-cdi component. The Java mail session that you configured within the WildFly configuration is injected into a Camel RouteBuilder through JNDI. The master endpoint provides a way to ensure only a single consumer in a cluster consumes from a given endpoint; with automatic failover if that JVM dies. This can be very useful if you need to consume from some legacy back end which either doesn’t support concurrent consumption or due to commercial or stability reasons you can only have a single connection at any point in time. The metrics component allows you to define, publish and collect metrics from Camel routes. The micrometer component allows you to collect various metrics directly from Camel routes. The milo-client component provides access to OPC UA servers using the Eclipse Milo™ implementation. The milo-server component component provides an OPC UA server using the Eclipse Milo™ implementation. The mina2 component is a transport for working with Apache MINA. The mongodb component provides the capability to interact with MongoDB servers. The mongodb-gridfs component provides MongoDB GridFS file storage. Instead of storing a file in a single document, GridFS divides the file into parts, or chunks, and stores each chunk as a separate document. The mongodb3 component uses the Mongo Driver for Java 3.4. If your are looking for previous versions, please look at the mongodb component. The mqtt component is used for communicating with MQTT compliant message brokers, like Apache ActiveMQ or Mosquitto. The mustache component allows for processing a message using a Mustache template. The mvel component allows you to process a message using an MVEL template. The mybatis component allows you to query, poll, insert, update and delete data in a relational database using MyBatis. The nats component is used for communicating with the NATS messaging platform. Netty client / server support in Camel is provided by the netty4 component. WildFly 8 and EAP 6.4 are bundled with module libraries supporting the Netty project version 4. Therefore, the standard netty component will not work since it is compatible with Netty version 3 only. OGNL expression support in Camel is provided by the ognl component. The olingo2 component provides the capability to interact with OData 2.0 and 3.0 compliant services via Apache Olingo. The olingo4 component utilizes Apache Olingo version 4.0 APIs to interact with OData 4.0 compliant service. The openstack-swift component allows messages to be sent to an OpenStack object storage services. The openstack-nova component allows messages to be sent to an OpenStack compute services. The openstack-neutron component allows messages to be sent to an OpenStack network services. The openstack-keystone component allows messages to be sent to an OpenStack identity services. The openstack-glance component allows messages to be sent to an OpenStack image services. The openstack-cinder component allows messages to be sent to an OpenStack block storage services. The opentracing component is used for tracing and timing incoming and outgoing Camel messages using OpenTracing. The camel-optaplanner component solves the planning problem contained in a message with OptaPlanner. The paho component provides connector for the MQTT messaging protocol using the Eclipse Paho library. The pdf component provides the ability to create, modify or extract content from PDF documents. This component uses Apache PDFBox as underlying library to work with PDF documents. The pgevent component allows for Producing/Consuming PostgreSQL events related to LISTEN/NOTIFY commands. The printer component provides a way to direct payloads on a route to a printer. The objective is to be able to direct specific payloads as jobs to a line printer in a camel flow. The The PubNub component allows you to communicate with the PubNub data stream network for connected devices. This component uses PubNub java library. The quartz component provides a scheduled delivery of messages using the Quartz Scheduler 2.x. The quickfix component adapts the QuickFIX/J engine for using in Camel. This component uses the standard Financial Interchange (FIX) protocol for message transport. The rabbitmq component enables you to produce and consume messages from RabbitMQ instances. The reactive-streams component enables you to exchange messages with reactive stream processing libraries that are compatible with the reactive streams standard. The reactor component integrates with Project Reactor a fully non-blocking foundation with efficient demand management. It directly interacts with Java 8 functional API, Completable Future, Stream and Duration. The ribbon component provides use of Netflix Ribbon for client side load balancing. The WildFly-Camel Subsystem only supports the camel-servlet and camel-undertow components for use with the REST DSL. However, the subsystem does not work, If you attempt to configure other components. The rmi component binds Exchanges to the RMI protocol (JRMP). The rss component is used for polling RSS feeds. The rxjava2 component allows you to use the RxJava API for processing messages on endpoints. The salesforce component provides producer and consumer endpoints to communicate with Salesforce. You’ll want to generate the necessary Salesforce DTO objects before starting. This can be automated with the Camel Salesforce Maven plugin. This example queries Salesforce 'Opportunity' objects. sap is a package consisting of ten different SAP components. There are remote function call (RFC) components that support the sRFC, tRFC, and qRFC protocols; and there are IDoc components that facilitate communication using messages in IDoc format. The component uses the SAP Java Connector (SAP JCo) library to facilitate bidirectional communication with SAP and the SAP IDoc library to facilitate the transmission of documents in the Intermediate Document (IDoc) format. A prerequisite for using the Camel SAP component is that the SAP Java Connector (SAP JCo) libraries and the SAP IDoc library are available for the WildFly-Camel Subsytem to use. The subsystem distribution does not include these libraries. You will need access to the SAP Service Marketplace in order to obtain them. Before using camel-sap, an additional WildFly modules needs to be configured so that the subsystem can discover the new functionality. Your application server should be stopped before making the following changes. Download the SAP JCo libraries and the SAP IDoc library from the SAP Service Marketplace, making sure to choose the appropriate library versions for your operating system. Start your application server and camel-sap will be available for use. This example uses XML files containing serialized SAP requests to query Customer records in the Flight Data Application within SAP. These files are consumed by Camel and their contents are then converted to string message bodies. These messages are then routed to an sap-srfc-destination endpoint which converts and sends them to SAP as BAPI_FLCUST_GETLIST requests to query Customer records. First we configure a destination data store. Next wire the destinationDataStore into a SapConnectionConfiguration. The Camel RouteBuilder looks like this. The XML request looks like the following and is consumed from a file within src/data. When the Camel route runs, the request XML data is consumed from src/data and sent to SAP as a BAPI_FLCUST_GETLIST request. The results of the SAP request are output to the console. You should see an XML structure like the following containing customer records. The example above only scratches the surface of the functionality provided by the camel-sap component. For comprehensive component documentation visit the Camel SAP Component Reference. The sap-netweaver component integrates with the SAP Gateway. You will need a valid SAP account in order to use this component. You can sign up here. The saxon component supports XQuery to allow an Expression or Predicate to be used in the DSL or Xml Configuration. The schematron component utilises Schematron to make assertions about the presence or absence of patterns in XML documents. The servicenow component provides access to the ServiceNow REST APIs. The servlet component provides HTTP based endpoints for consuming HTTP requests that arrive at a HTTP endpoint that is bound to a published Servlet. The ssh component provides security, based on the Apache Shiro security project. The smpp component enables SMSC over the SMPP protocol in order to send and receive SMS. The snmp component enables you to poll SNMP enabled devices or configure an SNMP trap. The solr component allows you to interface with an Apache Lucene Solr server. Camel contexts can be configured with Spring via the spring component. Spring Camel contexts can be deployed either as part of the camel subsystem configuration or by deploying a '-camel-context.xml' suffixed file. For more information see the features. The spring-batch component and support classes provide integration bridge between Camel and Spring Batch infrastructure. The spring-integration component provides a bridge for Camel components to talk to spring integration endpoints. The spring-javaconfig component provides Java instead of XML configuration capabilities for Spring camel contexts. The spring-ldap component provides a Camel wrapper for Spring LDAP. The spring-redis component allows sending and receiving messages from Redis. Redis is advanced key-value store where keys can contain strings, hashes, lists, sets and sorted sets. In addition it provides pub/sub functionality for inter-app communications. Camel provides a producer for executing commands, consumer for subscribing to pub/sub messages an idempotent repository for filtering out duplicate messages. The spring-ws component allows you to integrate with Spring Web Services. It offers both client-side support, for accessing web services, and server-side support for creating your own contract-first web services. The sip component is a communication component, based on the Jain SIP implementation (available under the JCP license). The sjms component, or SJMS, is a JMS client for use with Camel that uses well known best practices when it comes to JMS client creation and configuration. The sjms-batch SJMS Batch component is a specialized component for highly performant, transactional batch consumption from a JMS queue. The sjms2 component, or SJMS2, is a JMS 2.x client for use with Camel that uses well known best practices when it comes to JMS client creation and configuration. Only H2 databases are supported by default as WildFly has native support for this. If you want to use other embedded database providers, you will need to install the appropriate database driver. The ssh component provides the capability to interact with SSH servers. The StAX component enables messages to be passed through a SAX ContentHandler. It can also iterate over JAXB records using StAX. The stomp can be used for communicating with Stomp compliant message brokers, like Apache ActiveMQ or ActiveMQ Apollo. The stream component provides access to the System.in, System.out and System.err streams as well as allowing streaming of file and URL. The string-template component allows you to process a message using a String Template. The swagger module is used for exposing the REST services and their APIs using Swagger. The thrift component allows you to call or expose Remote Procedure Call (RPC) services using Apache Thrift binary communication protocol and serialization mechanism. The tika provides the ability to detect and parse documents with Apache Tika. The twilio component provides access to Version 2010-04-01 of Twilio REST APIs accessible using Twilio Java SDK. The twitter component provides the capability to interact with the Twitter API in order to create and consume tweets, timelines, users, trends, and direct messages. The undertow component provides HTTP-based endpoints for consuming and producing HTTP requests. That is, the Undertow component behaves as a simple Web server. Undertow can also be used as a http client which mean you can also use it with Camel as a producer. The Undertow component integrates with the Undertow server provided by WildFly. The configuration of camel-undertow consumers on WildFly is different to that of standalone Camel. Producer endpoints work as per normal. The velocity component allows you to process a message using an Apache Velocity template. The vertx component is for working with the Vertx EventBus. The Vertx EventBus sends and receives JSON events. The weather component provides integration with the Open Weather Map API. The wordpress component provides support for Wordpress API. The XMPP component provides the capability to produce and consume XMPP (Jabber) messages. The xstream component provides the XStream Data Format which uses the XStream library to marshal and unmarshal Java objects to and from XML. The zendesk component provides access to all of the Zendesk APIs via the zendesk-java-client. The camel-zipkin component is used for tracing and timing incoming and outgoing Camel messages using zipkin. Events are captured for incoming and outgoing messages being sent to/from Camel. Get and Set the data contents of arbitrary cluster nodes. Create and retrieve the list the child nodes. A Distributed RoutePolicy that leverages a Leader election. The zookeeper-master component provides a way to ensure only a single consumer in a cluster consumes from a given endpoint; with automatic failover if that JVM dies. Make sure that you do not duplicate modules that are already available in WildFly and can be reused. Here we follow the instructions on Try Origin. We use the All-In-One VM approach through Minishift on VirtualBox VM. The client tools are available from the Minishift installation. When running OpenShift in a single VM, it is recommended to reuse the Docker daemon which Minishift uses for pure Docker use-cases as well. By using the same docker daemon as Minishift, you can speed up your local experiments. With every WildFly-Camel release we also publish the latest wildflyext/wildfly-camel image. 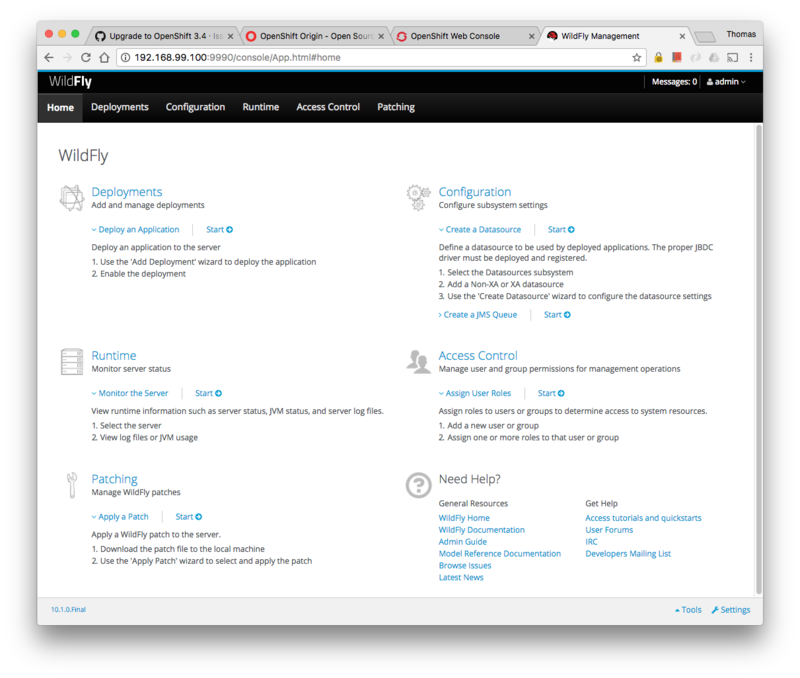 Here we run a set of WildFly-Camel servers on OpenShift Origin. The target platform is the local OpenShift instance that we created above. The example architecture consists of a set of three high available (HA) servers running REST endpoints. For server replication and failover we use Kubernetes. Each server runs in a dedicated Pod that we access via Services. A project allows us to create deployments, pods, services, routes, etc. under our own custom 'wildfly-camel' namespace. Now, lets create a new application from an existing wildfly-camel based image. It’s good practice to add liveness and readiness probes to the deployment. The pods running the JAX-RS endpoints are however not yet exposed to the world. Now, lets expose the HTTP root context of the running WildFly server. You can discover the exposed route host name with. You can clean up all created resources with. $ oc delete all -l "app=example-camel-rest"
Here we follow the instructions on Try Origin for binary releases VM. After having launched an instance of RHEL7 on EC2 we can ssh into the box. Then we install Docker and add the ec2-user to the docker group. If you see a failure during startup like this, follow the instructions below for Docker deamon configuration. The Docker registry may need to be marked as insecure. The process of creating a project and application follows that of OpenShift Local. The WildFly-Camel Docker image is capable of performing Source-To-Image builds. This enables you to build reproducible images from source. First you’ll need to download and install the S2I tooling from here. WildFly-Camel provides an OpenShift builder image, which enables you to do a source to image in OpenShift. First add the WildFly-Camel S2I ImageStream and the application template. Using project "myproject" from context named "minishift" on server "https://192.168.42.188:8443". In the OpenShift web console, go to the project where you imported the image stream and the template. When you select 'Add to Project → Select from Project' in the top right corner you should see a new catalog item named 'Wildfly Camel'. Choose this option, then provide the required parameters. Click 'Create' to start the build process. You’ll then be able to monitor your application S2I build and deployment in OpenShift. Eventually you should see your application with 1 pod running. Security in WildFly is a vast topic. Both WildFly and Camel have well documented, standardised methods of securing configuration, endpoints and payloads. Securing the Hawtio console can be accomplished via the following steps. Browse to http://localhost:8080/hawtio, and authenticate with the credentials configured for the management user. Additionally, you can use Camel’s notion of Route Policies to integrate with the WildFly security system. Camel supports the notion of RoutePolicies, which can be used to integrate with the WildFly security system. There are currently two supported scenarios for security integration.